One component of the Trump administration policies is to improve the growth rate of the economy through an infrastructure spending policy, reducing taxes and regulations and increasing spending on rebuilding the military. While campaigning he stated his policies would return the economic growth rate, GDP, to 3%. A number of economists, along with the Federal Reserve, indicate moving the growth rate of the economy to 3% will be a difficult task. To put the 3% growth rate into perspective though, up until and through the financial crisis, the long run GDP growth rate was nearly 3.5%. Since the financial crisis though, the growth rate has averaged 1.8%. For the first few trading days in March, the equity market seems to be consolidating the gains achieved in February. Sideways or small market pullbacks have been a common pattern for the market since the election. 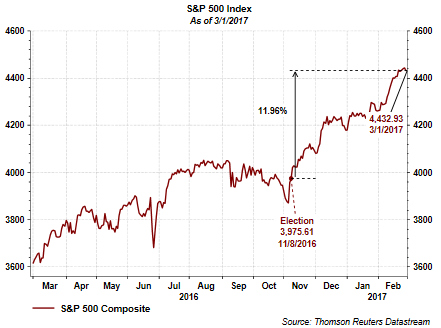 For the most part the market has corrected over time (sideways movement) versus a steep contraction during the post election advance. This type of market pattern can be frustrating to investors waiting for a more significant pullback so cash can be deployed into the market. As the below chart shows, the type of pattern formed for the market is what is know as a bull flag chart pattern and this pattern has developed again with this month's trading action. Periodically I provide a review of what individual members of Better Investing are purchasing. My last review or update was in August last year and BI members reported their top purchase was Apple (AAPL). Another purchase back in August was Southwest Airlines (LUV), so BI members seemed to be ahead of Warren Buffett's interest in airline stocks. In regards to Apple, BI members are reporting they are net sellers of the stock now. Amazon (AMZN) has been a favorite for some time and continues near the top of the list. CVS Health (CVS) has experienced weakness recently and BI members are reporting they are net purchases of this stock at the moment. Below is a list of the current Most Active stocks reported by Better Investing members. Time To Reduce One's Equity Exposure? The U.S. stock market has been on a steady climb higher since the November election. From 11/8/16 to 3/1/17 the S&P 500 Index has moved higher by 11.96%. This double digit return in a short period of time has some investors asking if this is an appropriate time to reduce equity exposure.